Our Company: Since our founding in 1978, it has been our philosophy to consistently provide professionals like you with superior products and services. We are pleased that a great deal of our growth has been the result of voluntary referrals from satisfied customers. The lab has been very fortunate to serve some of the most respected orthotic professionals of our time. We are proud to serve these world-renowned physicians, who serve world-class athletes. Our Employees: The foundation of the lab is a very experienced and knowledgeable work force. The lab’s technicians average more than seven years of tenure with the company. Maintaining a high level of technical expertise is critical to the business. To assure this level, Allied OSI Labs follows an in depth training and cross-training process. Meet our Owner: Dr. Miller is Board Certified by the American Board of Podiatric Surgery in Forefoot, Rearfoot, and Ankle Surgery. He is a fellow of the American College of Foot and Ankle Surgeons and is also a member of the American College of Podiatric Sports Medicine. Archway Orthotics manufactures fully custom foot orthotics. We are an Indigenous Irish company driven by industry experts and seasoned manufacturing engineers from the medical device sector. Archway is committed to providing podiatrists and allied health-care professionals with a product and service which will complement their clinic. A Passion for perfection and Pride in our product are the foundation that Ares is built on. We combined our pride in a job well done with many years of experience in both manufacturing and clinical environments to develop custom foot orthotic solutions. Constantly searching for ways to offer you better, faster service and better quality products is one of the hallmarks of dealing with us. We manufacture from negative and paper orders shipped to us or if you prefer technology… it’s as easy as 1-2-3, with the Easy Order system and a 3D foot scanner, your orthotics will be prepared and shipped within 2 days. Biotech Orthotic Design is a diverse orthotic manufacturing facility located in Elmsdale, Nova Scotia. Our goals include building your practice, utilizing traditional and advanced technologies of manufacturing, and bridging the gap between strong clinical assessment skills and technical orthotic application. Our BAPFOL accredited facility is dedicated to providing quality prescription foot orthosis to the technical standards defined by the Prescription Foot Orthotic Laboratory Association, the Pedorthic Association of Canada, the College of Pedorthics of Canada, and the American Board For Certification in Orthotics, Prosthetics, and Pedorthics, following the specific instructions provided by certified Medical Providers. Biotech consists of a group of Pedorthists, Pedorthic Technicians, and an Orthopaedic Technician certified in their respective fields. We take great pride in our quality products and most of all our personalized efficient technical and administrative services. Our knowledgeable staff is understanding of the patient clinician relationship and strives to ensure a positive outcome for all. President's Message: Each COL orthotic incorporates functional design, quality materials and the highest standards in manufacturing quality. Our attention to detail throughout the manufacturing process - over 15 quality control checks before shipping - ensures that your prescription is durable, comfortable and prepared to your exact specifications. When you combine our range of devices, our quality of production and our guaranteed service and satisfaction - plus excellent prices - it all adds up to value. When you look through our web site, compare our products and services and then you be the judge. For a complete look at all our custom orthotics, contact us and ask us to send you our brochure. I know that we have succeeded when I hear from both our original customers and our new customers, that our orthotics are beautifully made, have great attention to detail and are loved by their patients. It is solving your problems that have led to our increasingly diverse lines of custom orthotics and to our new line of ready-made orthotics. Chinook Orthotic Laboratory is based in Calgary, Alberta, Canada; home of the Chinook phenomenon. Warm Chinook winds from the West cause clouds to form a distinct arch, and bring relief from the cold of winter. Much like warm Chinook winds, take comfort in our quality & accuracy guarantee. We understand you have options when choosing an orthotic lab, and thank you for considering us as your main manufacturer. Our Philosophy: We strive to deliver excellent clinical results by means of a superior quality product at a fair price. We see our clients as long-term partners and endeavor to give each practitioner exactly what they want and need from their orthotic laboratory. We balance function, aesthetics and cost to give you and your patients the best possible foot orthotic. 3 - 6120, 11th Street S.E. Cox Orthotics is a leading edge custom foot orthotic laboratory. We are dedicated to helping healthcare professionals provide effective orthotic therapy to their patients. The company offers a wide range of custom AFO and foot orthotic options to help people lead more active, healthier lives. We manufacture and distribute orthotic devices only as prescribed by medical practitioners. Our lab is different than most others. What makes us special? We develop trustworthy relationships with our clients. Cox Orthotics is not a high volume lab. Therefore we provide the personal service each practitioner expects. We take the time to make each and every pair of orthotics exactly how you need them. We have more direct control of the quality of our techniques because we are not high volume. Most of our clients previously used other big labs and became dissatisfied with the quality, turn around time and prices. Our average turn around time is five working days in the lab. Dr. Comfort was founded in 2002 and is the worldwide leading provider of diabetic footwear. We became the leader by recognizing the need for STYLE, COMFORT and QUALITY in the therapeutic shoe industry. Today, our family of comfort footwear line includes diabetic shoes, prescription and non-prescription inserts, diabetic socks, slippers, sandals and compression hosiery. Comfort and quality are exactly what the doctor ordered. At Dr. Comfort, you'll discover uniquely stylish orthopedic shoes that look as great as they feel! Our shoes, slippers, socks and inserts are designed to keep your feet healthy and happy - today and tomorrow. Medicare and supplemental insurance may reimburse for all or part of the cost of Dr. Comfort shoes and prescription inserts for diabetics who meet certain general criteria. "I believe the most productive part of my workday is the time I spend discussing individual, patient’s cases with our doctors. I know that most labs have customer service representatives, and it is out of the ordinary for the owner to be accessible for biomechanical consults. For me, it is a method that draws me closer to that patient; giving me a greater understanding of their foot problems, and how it affects their daily life. It allows me to convey that understanding to my employees – from the design analyst, to the glue room, to quality control, all the way to our shipping department. Doctors continually express how much these brief dialogues improve the patient’s result with orthotic therapy. Every day is a full agenda for a lab owner. There’s a business to run, employees to supervise, and customers to attend to. Meeting the needs of the patients, that rely on Earthwalk to relieve their pain, is always paramount. It is the basis for all other tasks. When you really feel that you are instrumental in the healing process, you instill confidence through competence and compassion. All of us at Earthwalk value the trust you have place in our charge, and will use all of our experience and skills to help insure a successful outcome for the patients we all serve." 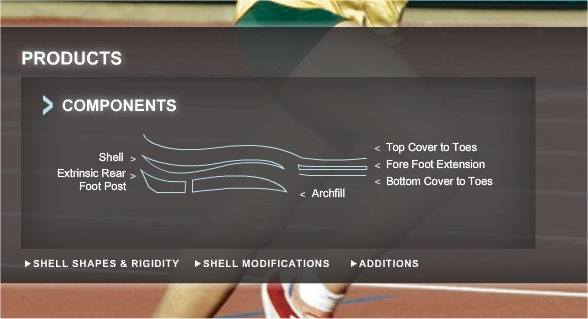 Fiber Orthotics' reputation is built on vision, determination, and an abiding commitment to core beliefs. At Fiber Orthotics, our experience in the orthotics industry goes back more than 60 years, and reflects an unwavering dedication to the highest quality products, continued technological innovations, and extensive professional associations within the industry. It's the reason we are known as one of the most experienced custom orthotics specialists on the east coast! We are proud of our long heritage as family owned and operated company, and of our experienced and dedicated staff. Contact us to discover why we've earned our reputation for quality products and unparalleled personal customer service. Firefly orthoses are custom made foot orthoses designed and manufactured using advanced computer technology (CAD-CAM / computer aided design - computer aided manufacture). Each device is formed on a manually or digitally "dressed mould" of foot impressions sent to us. (Manually via vacuum forming thermoplastic or digitally via CNC milling). We do not use a "library" of shapes or any variation of a pre-moulded shell. Firefly operates AOMS laser scanning of casts or impression boxes. This allows practitioners to choose traditional standard or direct milled prescription foot orthoses. CAD-CAM direct milling of polypropylene blocks produces custom made prescription foot orthoses. CAD-CAM milling of positive models produces vacuum formed thermoplastic and carboplastic custom-made prescription foot orthoses. Firefly uses a manual 'state of the art' automated fabrication stream, utilising Sharp Shape's Automated Orthoses Manufacturing System (AOMS). AOMS consists of a cast scanner; digital corrections workstations and computer numerically controlled (CNC) milling equipment. Foot Management is located on the eastern shore of Maryland and has specialized in manufacturing custom foot orthotics for over 35 years. We are accredited by the Prescription Foot Orthotic Laboratories Association and we are a member of the Pedorthic Footwear Association. Our company is operated by certified pedorthists and we fabricate a variety of durable orthotic devices by utilizing slipper casts, foam impression trays, and laser scans of patient’s feet. We accurately modify each orthotic to fit the individual accommodations of each patient to reduce their foot pain and discomfort. In addition to custom devices, we offer a prefabricated selection of products to relieve foot pain, heel pain and foot fatigue. We carry half and full length Turf Toe® plates as well as prefabricated insoles, heel lifts, moleskin, Aqua-Temps®, and an assortment of foot pads. We are dedicated to bringing clients excellent customer service and high quality orthotic devices that are made with pride by people who care. Foothealth UK are a specialist supplier of bespoke orthotic devices located in Oxfordshire, UK. Using Sharp Shape's Automated Orthotic Manufacturing System (AOMS) for cast correction, our CAD-CAM technology produces precise products directly milled on HAAS CNC machinery to meet the individual specifications required for each prescription. Each orthotic is then carefully hand finished by our skilled craftsmen with the specified accommodations and top covers. Using advanced technologies combined with the experience and knowledge of our professional team we are able to provide high quality products, swift turnaround times, and offer an outstanding service to our clients. Founded in 2006, Integrated Orthotic Lab offers quality custom Orthotics, on-time production, and reliable service. Integrated Orthotic Lab has built a reputation within the industry of bringing to market great products and solutions that have been thoroughly researched for their optimum potential. Through this, Integrated Orthotic Lab has gained credibility and respect within the industry, establishing partnerships with some of the world’s most famous brands. All Devices have 100% warrantee for 2 years on all shell modules, and 6 months on all top coverings, accommodations and postings. We are committed to providing 3 to 5 day turn around times without delay. Our ownership has built a great reputation maintaining this standard! Integrated Orthotic Lab has been using the Sharp Shape AOMS system since the beginning. Mid Star Lab is a family owned and operated small business serving Podiatrists locally and throughout the Midwest. We believe that quality service is the first step to providing optimal patient care. With 25 years of experience, our Certified Pedorthists, Orthotists and Certified Shoe Fitters deliver a team approach and we are committed to providing leading pediatric and adult orthoses. We invest in the technology and techniques that help our customers receive affordable, durable and precise devices. We carry an extensive product line of orthotics which includes sport, rigid, children's, fashion, leather and accommodative orthotics. And we offer orthotic refurbishing whether they were made by us or not. We now offer custom orthotics and refurbishing for the public at our new location in Edwardsville, KS, just 5 miles from The Legends/Kansas Speedway in Kansas City, KS. We also offer diabetic and therapeutic shoes and shoe fitting, ankle and foot orthotics and body braces. We are excited to see the many ways we can help and serve our customers and your patients. Our staff never forgets that our work improves the quality of life for those we serve and are committed to one week turnaround time. North Star Podiatric Lab provides fast, accurate and affordable prescription foot orthotics to the health care industry. North Star Podiatic Lab manufacturers and ships custom foot orthotics in 7 days or less, which enables patients to move more quickly toward pain relief and recovery. For more than 20 years, North Star Podiatric Lab has worked to become the standard by which pedorthic services are measured. The Board for Accreditation of Prescription Foot Orthotic Laboratories (BAPFOL) accredits North Star Podiatric Lab for quality assurance and expertise. North Star Podiatric Lab manufactures prescription foot orthotics. We combine three-dimensional scanning technology and computer-aided design to construct quality prescription orthotics. Foot-care professionals must rely on their orthotic labs to deliver results from the work they begin. The quality of the orthotic lab becomes an extension of podiatric practice itself. North Star takes its services a step beyond ordinary podiatric programs, which in turn, benefits the professional’s bottom line. North Star’s online and archival services significantly enhance the speed and accuracy with which orthotics can be manufactured, whether they are produced from scan, cast, or impression. Our Mission at Orcom is a simple one, excellent quality and value. We treat each device we make as if it were for family. We put the effort into getting it right the first time, saving you time and energy and getting people back on their feet fast. With over 22 years in the Foot Orthotics industry we have gained vast experience. Over the years our technology and materials have evolved allowing us greater quality control. We are continuously working to adapt our product line to the ever changing needs of our practitioners and patients. Every device made at Orcom is custom, We DO NOT use any prefab "customizable" insoles. We are committed to making each Foot Orthotic as unique as the patients we serve. 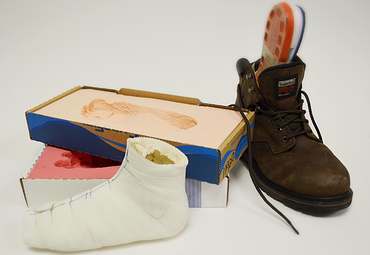 We model our Orthotics from slipper casts, foam impressions and digital scans. We retain our scans indefinitely for efficient reorder. In short, we are a company committed to quality and affordability. We strive for excellence and take pride in our workmanship. We create products that we are proud of and look forward to sharing them with you. Orthotic Energy is a dynamic Toronto based Orthotic Lab manufacturing custom made orthotics. We offer personalized service to various health care practitioners all across Canada.Our mission is to provide our customers with the finest quality orthotics and orthopaedic footwear in a timely manner at reasonable prices. We are pleased to present you with a wide range of products and services to fit the needs of your patients and your practice. We provide knowledge, experience, technology, and friendly service all under one roof. Our success is due to your support and your patients’ comfort. We are growing every day and we make sure you benefit from our growth with new products, technical innovations and service improvements. We will continue to work for your patients and you as we continue to grow. Our mission is to provide our clients with the finest quality and Superior Workmanship, with Reasonable prices and the fastest Services and Turn around time available in custom made Orthotics and Orthopedic footwear in the GTA. Ali Sasan Bassir (B.Sc. Eng.) has had spent the last ten years in the management of manufacturing plants. 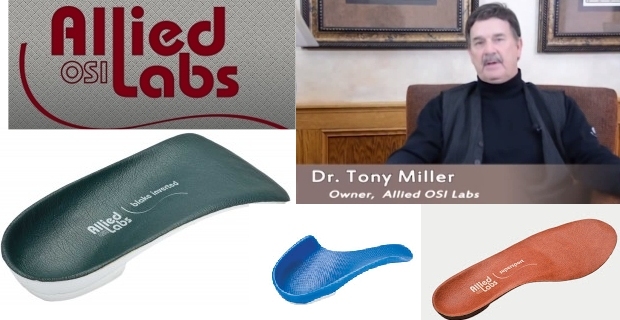 He has years of experience in the manufacture of orthotics in the greater Toronto area. Ali works closely with Podiatrists, Chiropodists, Chiropractors and Pedorthists to make sure their prescriptions are manufactured to exacting standards and co-operates closely with them to ensure therapeutic success. Simin M Bassir (B.Sc. Biology) is a Certified Laboratory Technician and a competent Certified Aqua Fitness instructor with several years of experience working with seniors as well as younger people to reach their best health condition. Simin oversees scheduling issues at our lab. In partnership with leading orthotists and podiatrists, Pacific Orthotic Laboratory manufactures the highest quality custom foot orthotics available. Sharpe Shape CAD/CAM solutions help us to create foot models unique to each patient. Our targeted range of products include: biomechanical, accommodative, fashion, sport, pediatric, and specialty devices. Decades of experience in negative casting evaluation and our meticulous technique result in precision engineered products unique to each patient. We utilize proven materials from top-quality manufacturers including performance components like Carboplast II, DBX9, and TL 2100. We unconditionally guarantee the satisfaction of your patients! Our highest priority is the total satisfaction of practitioners and patients. We are the first and only lab in Virginia that is accredited by the Board for Accreditation of Prescription Foot Orthotic Laboratories (BAPFOL) and one of only two BAPFOL accredited facilities in the Southeastern United States. Our name symbolizes our philosophy -- to work in partnership with our medical practitioner customers to create the finest orthopedic devices available: we specialize in accommodative, semi-rigid, and functional foot orthoses. We work with a wide variety of providers: physicians, orthotist/prosthetists, pedorthists, physical therapists, and athletic trainers. Because of the versatility of AOMS we can use the practitioner’s preferred foot impression method of slipper casts, foam impressions, or digital scans to fabricate our custom devices. Our lab has certified pedorthists ready to consult with you and our company has seven accredited pedorthic facilities ready to serve our providers and their patients at locations throughout the mid-Atlantic. We offer outstanding professional service and going the extra mile for our clients is never problematic or questioned: it’s our standard! Partnership Fabrication Systems is part of Richey & Co.
Vince grew up as an athlete in Portland, Oregon. After completing his bachelor's degree at the University of Oregon in 1985 he went on to post graduate work at the Rolf Institute in Boulder, Colorado. Course work included anatomy, physiology, kinesiology and biomechanics. He furthered his training at Northwestern University school of orthotics and prosthetics and was board certified as a Pedorthist in 1996. Vince has been involved in the study of the human structure and has been building foot orthotics for over twenty years. Pine Tree Orthopedic Lab and Comfort shoe store offers a large line of comfort shoes, over-the-counter orthotics and a variety of shoe and foot care products in our well-stocked retail store. We also have a full-service Orthopedic Lab that can fill your prescription for custom-molded orthotics and ankle foot orthoses (AFOs). We have a national reputation for quality products that are tailored to each patient's individual needs. Please take the time to browse through our web site and learn more about us. Foot related problems can often cause so much pain and discomfort to a person, that it affects their daily life. Realizing the need for specialized foot care products for the people of Central and Western Maine, we have opened our 2,000 square foot retail facility aimed at helping customers relieve, or eliminate, their foot related troubles. PodScan is a progressive business that works together with its customers to increase productivity, efficiency and ultimately improving the bottom line of your business. PodScan can show you how to benefit from years of experience in the application and promotion of 3D Laser scan orthotics to benefit your practice. Unlike some systems of orthotic manufacture, there are no expensive royalties, no need to store blanks, no expensive in house milling machines or mess in your clinic from orthotic manufacture which gives the practitioner time to focus on what they do best — treating patients. Free up your cash flow, and your time and take the hassle out of prescribing orthotics. Precision Orthotic Lab, International was founded in 1979 by a podiatrist and businessman to deliver quality products, effective customer service and fair prices to podiatry and healthcare professionals. Our mission is to help the podiatry and healthcare professional create additional value in their practice by offering the finest, biomechanically accurate prescription and prefabricated foot orthoses at fair market prices, while delivering unparalleled customer service. Our cast correction technology center utilizes Sharp Shape's Automated Orthotic Manufacturing System (AOMS), combining optical laser cast scanning and CAD/CAM software to assure enhanced clinical outcomes based upon the most accurate biomechanical correction of your patients' casts. As an adjunct to the AOMS manufacturing system, Precision offers an office-based optical laser foot scanner, easily transported between examining rooms. We manufacture a complete line of prescription functional and accommodative orthoses’ as well as prefabricated devices. In-house production averages five to six working days. Precision offers free postage on incoming orders, and provides shipping cartons for your convenience. Local orders (greater Philadelphia, PA metropolitan area, southern New Jersey) are delivered one week from the date of cast pick up; mail orders ship UPS ground or UPS Second Day Air. We also mail orders to all the world. Prolab believes in technological advances that improve efficiencies without compromising treatment standards and patient care. After years of research and testing, ProLab’s medical team found that the Sharp Shape 3D digital foot scanner meets our exact specification for manufacturing high quality custom functional foot othoses. The scanner increases efficiencies by streamlining patient flow, saving time to allow more patient office visits and by cutting costs with the elimination of plaster casting time and materials. Unique to ProLab is our medical consult service available to clients. Our consulting team is made up of nationally known podiatrists who are educators of biomechanics and orthotic therapy with clinical and practice management expertise. Choosing ProLab gives you an EBM treatment advantage, better clinical outcome, and consultations. Selecting an orthotic lab is an important partnership decision. Choose carefully — choose ProLab. Sole Provider is a 100 per cent locally owned and operated business that specializes in the assessment and fabrication of orthotic devices. Located in Kentville at 70 Exhibition Street in the Professional Building, we are one of the province's only full time orthotic providers west of Halifax. Owner Jeff Skaling, a Certified Pedorthist, and Julie Skaling, a Certified Pedorthist and Physiotherapist offer quality foot care in a professional setting. Sole Provider also carries a great selection of orthopedic products including braces, splints, arch supports and other items. We also carry products for painful conditions such as tennis elbow, carpal tunnel syndrome, tendonitis, and patellofemoral syndrome (a common knee problem). You'll find canes, walkers, crutches, ObusForme™, and more, including Aids for Daily Living. Sole Provider Custom Orthotics Inc. If you are a podiatrist, a chiropractor, a pedorthist, a runner, a jogger, a sportsman, or a patient searching for "where to get foot orthotics" and you landed on this page, you are at the right place. The above podiatric laboratories and foot orthosis manufacturers (foot orthotic labs) can provide you with quality products. Each one has its own specialties and unique geographical-locations. Please feel free to contact them to get product information, price and turn-around time. Labs are listed in alphabetical order. AOMS is the most popular orthotic manufacturing and production system. The above list does not contain all the labs that are using AOMS. As of March 2016, the number of AOMS labs listed here is less than half of the total AOMS labs. For more lab choices, you can visit www.pfola.org (then click Member Directory on the left) or contact us. If you are an AOMS lab and want to be added to the list, please contact us at: sharpshape@comcast.net.